This video will show you how to make Totoro Onigiri (Rice Balls). Rice ball is called "Onigiri" in Japanese. Mostly it's shape is triangle and you can mix ingredients into rice and/or fill your favorite ingredient in the rice ball. It is perfect for Bento box! 1. Put steamed rice in a bowl. Then mix ground black sesame seeds until you reach the desired Totoro color. 2. Place the rice in plastic wrap so that the rice won't stick on your hands. 4. Form the rice into a triangle by pressing lightly with your palms. 5. 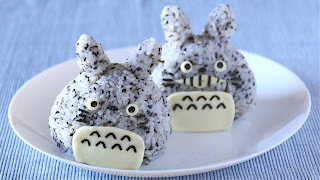 Make Totoro's ears using a small amount of rice. 7. Cut sliced cheese with a toothpick to make Totoro's face parts and body parts. Cut Nori sheet with scissors or use Nori punch to make Totoro's face parts and body parts. Attach them on Onigiri.